USCIS teleconference Q&A conclusion points explained. Breaking News: USCIS will start implementing NTA policy starting Oct 1, 2018, for i539 (like H4, H4 COS) and i485 applications. At this time, USCIS is NOT implementing NTA for employment-based petitions including H1B. Sufficient time to be given before NTA is issued – USCIS will send denial letters for applications that ensure you are provided adequate notice when an your application is denied. If you are no longer in a period of authorized stay and do not depart the United States, USCIS may issue an NTA. USCIS will provide details on how applicants can review information regarding their period of authorized stay, check travel compliance, or validate departure from the United States. Aug 24, 2018 – Business Roundtable has sent an official letter of support to USCIS, signed by Apple, ADP, American Airlines, Pepsi, Coca-Cola among other CEOs to rethink their NTA policy. July 30, 2018 – USCIS delayed the execution of NTA policy due to pending ‘operational guidance‘. Operational guidance was expected to be issued to USCIS consultants within 30 days of June 28, 2018. But, it has not happened yet and hence, NTA policy is not executed at this time. What is NTA (Notice to Appear)? An NTA is a document that instructs an individual to appear before an immigration judge. This is the first step in starting removal proceedings. On June 28, 2018 changed its policy to allow USCIS consultants to initiate ‘Deportation Proceedings‘ using NTA (Notice to appear) for anyone who’s visa change of status, extension or transfer has been DENIED. Before this policy change, ICE was the primary authority to issue such NTA. CBP and USCIS also had the authorities to go for such NTA in very limited cases of immigration violations like criminal offenses. Now, the visa denial has been added as criteria to go for NTA by USCIS directly without going through ICE. USCIS can issue NTA for people who’s application for a visa extension or change of status, a green card, or citizenship application is denied and their status becomes unlawful in the US. Your unlawful presence starts the day your visa is denied by USCIS in case your i94 has already expired. NTA issued after my H1B extension has been denied? If the NTA is issued by USCIS for you, you have the obligation to stay in the US and appear in immigration court proceedings. Or at least hire a lawyer (Attorney) to appear in immigration court on your behalf if you decide to leave the US. NTA issued, departed US – fail to appear in immigration court? 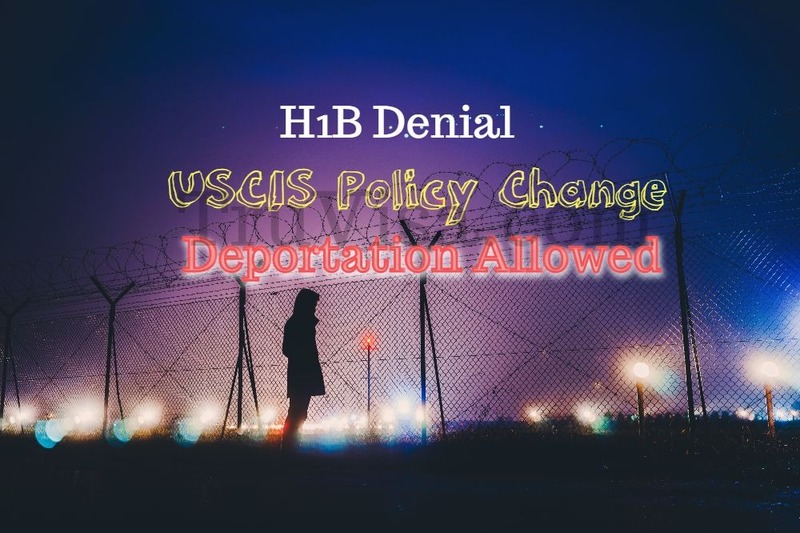 A simple H1B visa extension denial after i94 expiry can lead to NTA and if your failure to appear in court will lead to the issuance of the forceful deportation order against you. It also carries a 5-year ban on re-entry to the US. This tricky situation is going to result in a big trouble for an H1B worker or any visa holder. You are working on H1B visa after your i94 expiry and H1B extension has been filed before i94 expiry. You are legally allowed by USCIS to work and stay in US up-to 240 days. Now, if your H1B extension is denied, your status in US is counted as ‘Unlawful presence‘. This is a real-life scenario as H1B extensions filed in regular processing take more than 8 months easily to reach a decision. The best option, in this case, is to leave US immediately on visa denial. That’s what every H1B worker has been doing over the years to stay on the right side of immigration law. If NTA is issued after this denial (since you started gathering unlawful presence as of the date of denial by USCIS), the H1B holder ‘may’ decide to stay in US and contest his case in immigration court which may take years to reach a decision. Remember that ‘All the time’ that you in US after your visa denial, you are adding ‘Unlawful presence’ automatically. You WIN immigration court NTA case: Your status in US after your visa denial to the date of case win will be restored as legal. You LOSE immigration court NTA case: Your status is ‘Unlawful Present’ and it carries a 10-year ban. Do you see the potential problem here? Since Trump administration is not able to change the laws to curb legal immigration, they are trying their best to scare the individual person by throwing un-necessary court cases at them. Who do you think will have the time and resources to fight the immigration cases if they came to US to work legally? An NTA can potentially ruin their future chances to ever come back to US legally again and work. Can H1B work after extension denial while fighting NTA case in court? NO, you cannot. Once your work authorization is denied, you cannot work in US. Your simple H1B extension denial has the potential of turning your career upside down and stamp you with ‘illegal’ non-immigrant from ‘legal skilled worker’ in a matter of days! Issuing NTA makes an H1B worker the biggest target and indirectly forces every H1B extension or transfer application to be filed in ‘Premium processing’, if not suspended. If you want to avoid any potential NTA for your case, you will certainly want to get your extension approval before your i94 expires. And if you want to make sure you get a result quickly, you have to pay for premium processing. Life is going to be even more difficult, restricted and expensive for skilled workers after this new policy. Once in deportation proceedings (NTA) after visa denial, the visa holder must prove his lawful status in US. Recently, USCIS changed policy for F, M and J visa holders and barred STEP OPT candidates to work at third party locations with respect to unlawful presence in the country. Now, she is planning to apply H1B through one of the Company. Is it valid to apply for H1B as her I-94 has expired but eligible to stay for 240 days in USA? Since this question is out of scope of this article, I have added it on am22tech form and answered here. Please ask your follow up questions on forum page itself. Could you please help me in below case..Sorry, I have added the same query under another thread. (a small consulting company). Around 3 years back I switched to an India-based MNC here, working at the client worksite from day1 and will be continuing working for the same client at the same location for few more years. Now, my current employer is in the process of filing for extension under normal category, but I am requesting to file it under premium processing. However, I came across few questions and concerns in light of NTA policy update on Sep 26, 2018 and no more RFE for extension. 1. I have the client invitation letter where the project duration is mentioned for 3 years and Statement of Work (SOW) which gets renewed every year and all other relevant supporting documents will be provided by my employer. I am thinking about requesting for premium processing so as to find out if the extension is getting approved for 3 years or only until the end of my 6 years on H1B. 2. Also, I am concerned if RFE is still being issues by USCIS for any missing documents OR its simply getting Accepted/Denied without any RFE? 3. If the premium processing H1 extension request is denied due to some reason, will it cease my work authorization immediately even though my I-94 is valid until April 2019 OR I am still authorized to work till my I-94 expiry? 4. if its filed under normal category, will I be legally allowed to work in US for 240 days from the date of my current I-94 expiry post filing of my extension? 5.1 If my extension is not approved before 240 days and is in pending status, what step I should be taking in this case. 5.2 If the extension is denied within 240 days after the expiry if my I-94. I will I be getting any NTA from USCIS or I can leave USA without any issues. 5.3 Will there be any impact on my dependent H4 visa holders. Please can suggest/advise if I should be filing the extension request under premium or normal category. Thank you! 1. Not sure if its a question? 2. RFEs are still being issued for H1B extension cases. Do not worry if you submit all required documents from your side. If USCIS wants to get more information, they will issue RFE. 3. If your H1B extension is denied, you can work until your current i797 h1B approval is valid. The extension is for future time that begins after your current approval ends. 4. Yes, you can work upto 240 is your H1B extension application is pending at USCIS after i94 expiry. 5.1. You can stay in US but cannot work after 240 days. Normally, it is better to leave US and wait outside for your H1B result. 5.2. If extension is DENIED anytime after i94 expiry, you immediately go ‘out of status’. It is recommended to leave US within 10-15 days after denial. NTA is not issued immediately and on top of that, USCIS is NOT issuing NTA for H1B at the time of my writing. 5.3. Your dependent H4 status is attached to your H1B status. If your H1B is denied, they also fo out of status along with you. If I file it under normal category, the processing time will be between 6 to 9 months and in the end if I don’t get 3 years extension based on approved i140 from previous employer and its only approved until the end of my 6th year visa (including 3 months stay outside USA) , then I will not have enough time in hand . And if it gets denied after waiting for 8-9 months , I will have leave USA within 10-15 days..
Based on my current situation and approved i140 from previous employer, please can you suggest if I should continue with normal processing or request to convert it to premium. Thank you! I suggest to apply in premium and get result faster than waiting for 8 months. It does not matter if i140 is from other Employer. It is allowed to be used for H1B extension. H1B extension is filled in regular category on 15-Sep. I am planning to continue my stay in US for authorized 240 days. 1. NTA will be not be issued for H1B/ i129 extension , I can leave immediately ( the days from 30-Sep to 20-Dec will be counted authorized days ). Correct? or am I wrong and NTA can be issued to H1B extension too? 2. NTA can be issue for H4/ i539 extension? 3. Or can we just leave country after denial without any consequence ( just accumulating a few days ) say we leave on 23-Dec? 1. Do H4/i539 extension also have authorized 240 days? 2. can they leave any time in 240 days before decision is taken ( like on 1-Dec )? 1. NTA will not be issued for H1B at this time. You can leave after your denial. 2. NTA can be an issue for H4 extension but it won’t be issued immediately. USCIS has told that they will give some time (not sure how much at this time) to allow person to go out of USA if extension is denied. 3. You can leave USA after denial usually within 10 days time. It should be okay. 2. Yes H4 can leave anytime before the decision is taken. H4 extension applied along with H1 at same time ( May 2018 ) – But h4 applicant was not in US (H1’s employer submitted this by mistake). H4 applicant entered US after vacation on June 2018 & still in US. H4 extension is still in pending status ( Vermont service center ). Told employer to withdraw H4 extn immediately after submission, but they told they will not do it and its not an issue. Please let us know whether we need to worry or not ? I am not clear about your question. Are you asking about H4 Extension being an issue? Who’s i94 has expired? H1B or H4 or both? Hi Anil, I am sorry for the confusion. Do you see any issues with H4 extension as it was applied while applicant was NOT in US ( May 2018 ). H4 applicant went for vacation outside US on Jan 2018.Returned to US after vacation on June 2018 with old visa which was valid till sep first week 2018. H4 extension ( applied on May 2018 ) is still pending ( USCIS yet to make a decision ). H4 Applicant’s I94 expired on Sep first week of 2018. By any chance, will USCIS consider H4 extn as abandoned or will they deny it ? Or will they approve it as now the H4 applicant is in US ( will continue to be here till the decision ) ? Worst case scenario if it gets denied or abandoned, can H4 submit another extn request ( i539 ) with out leaving US ? Note :H1’s extn applied at same time ( May 2018) got approved a few days back for 3 years ( H1 applicant is in US during the whole extn process ) H1 extn was upgraded to premium on Aug 2018. As per my information, USCIS will probably deny H4 extension or may send an RFE to prove the H4 status. Not sure how they even applied for H4 extension as it is meant to be applied only when you are in USA and want to extend your stay. If your current H4 extension is denied, you can apply for H4 extension again but your expired i94 will certainly be an issue as you will be ‘out of status’. You should ideally have gone out of US before your i94 expiry and got the H4 visa re-validated using your H1B’s approved i797 and they would have extended your i94. Or you can go out of US and get H4 visa stamped using h1B i797 without waiting for extension result and un-necessarily adding complications to your case. Due to health reasons,H4 is trying to avoid a travel outside country. If H4 extn get RFE and if we submit proof of H4 living in US, do you see any possibility of approval? Worst case scenario if it gets denied ( with or with out RFE ) and if H4 move out of country, do you see any issue in H4 visa stamping ( using h1 approval ) & come back to US ? If H4 travel now ( with out waiting for decision ) & get stamped at home country ( using H1 approval ) , wht is the process to cancel pending H4 extn application? 1. H4 RFE: If you get RFE and submit the proof, then there should be no issue. 2. H4 Visa stamping after H4 extension denial – The denial reason will probably define what kind of issues you can face. 3. H4 travel to get stamp – As per my opinion, it is a good idea to travel to and get stamp as early as possible due to the new NTA policy. You never know what can happen and should avoid uncertainty as much as possible. Myself (H4), Husband (H1B), Child (US Citizen), currently in USA. We are traveling to India In Nov 2018. In the DS160 form, should we say YES or NO to below Question. If YES, then we need to add spouse/child info. Do you have any immediate relatives, not including parents in the U.S.? Means fiance/fiancee, spouse (husband/wife), child (son/daughter), or sibling (brother/sister). and have already answered it there. You can ask your follow up questions,if any, there itself. Let me know if you need more information. I have 2 questions 1) Is it good Idea to leave country before a decision is made on the pending H1b extension and reenter if the petition is approved ?if we are on 140 past 6 yrs of H1 ,what is the impact if we leave country .some say we have to do consular processing what is it. 2)incase if we stay here after 1-94 expiry and if H1 extension is denied if we leave immediately and enter back us with H4 visa. Can the NTA issued for H1 be faced on H4 status? 1. USCIS legally allows to stay and work in US if your H1B extension is pending up-to 240 days after i94 expiry. After 240 days, if the extension is still pending, it is recommended to leave US and wait for result outside. Consular processing: Simply means get your visa stamped at US embassy outside USA. 2. An NTA can now be issued for the case where i94 has expired and your H1B extension is denied. This is what USCIS has changed in their new policy. Well, if an NTA is issued, there is no restriction on changing of status to H4. You can re-enter USA on H4. But, the NTA, if issued, has to be taken care in immigration court. You have to appear in court and explain your points for judge to make a decision on your case.